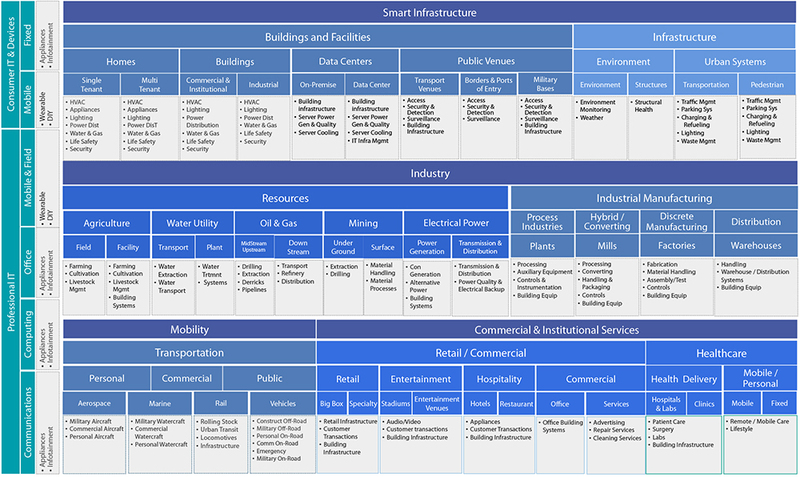 The ten market arenas – termed “Venues” by Harbor Research as they differ slightly from traditional vertical industry sectors – represent the key areas where Harbor Research believes IoT and Smart Systems opportunities will develop in the coming years. In turn, these contain over 300 distinct connected product or device segments that Harbor Research tracks. Within each ven­ue, these devices are organized into application segments (e.g. ‘hospitality’ within the Retail Venue) and customer segments characterized by where they are used and what function they carry out. Device segments, in turn, are viewed within customer and application segments (e.g. POS systems within the hospitality segment of the overall Retail Venue). Want to explore our market dimensioning?